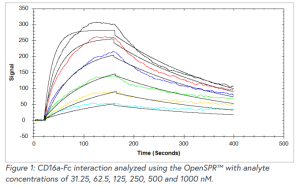 OpenSPR™ is a powerful instrument providing in-depth label-free binding kinetics for a variety of different molecular interactions. 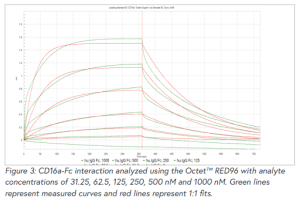 To demonstrate the powerful capabilities and accuracy of the OpenSPR™, a side-by-side comparison study was conducted against a Biacore™ 3000 and Octet™ RED96. 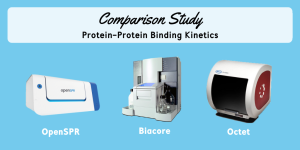 The Biacore™and Octet™ systems, are commonly used for analyzing binding kinetics but cost hundreds of thousands of dollars, making them inaccessible to many researchers who need this data. 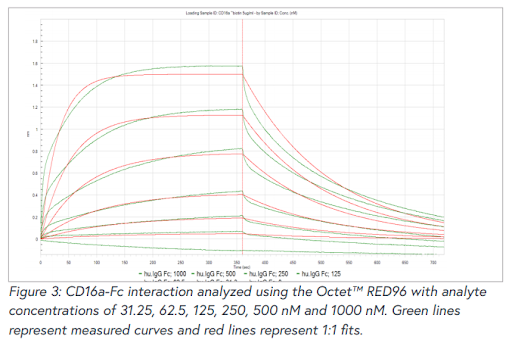 To show that OpenSPR™ is able to generate comparable results to the Biacore™ and Octet™ for a fraction of the cost, an Fc-FcR interaction was analyzed using these three instruments under similar conditions. How much does OpenSPR™ cost compared to the industry standard Biacore™ or Octet™? 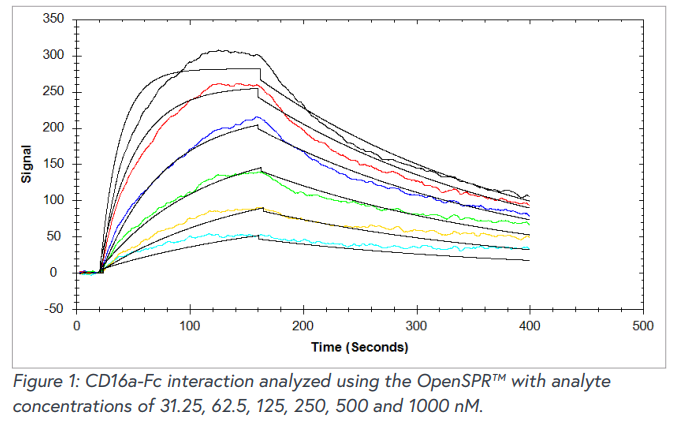 OpenSPR is a benchtop SPR solution which provides researchers with the ability to complete in-depth label-free binding kinetics in their own lab. Compared to the standard SPR or BLI solutions in the pharmaceutical industry, Biacore™ SPR and Octet™ BLI instruments costs hundreds of thousands of dollars. With OpenSPR, you can get the same data as a Biacore™ and the Octet™, from the convenience of your own lab for a fraction of the cost of these instruments. This allows researchers to accelerate their research and publish faster than with the Biacore™ and the Octet™ systems. 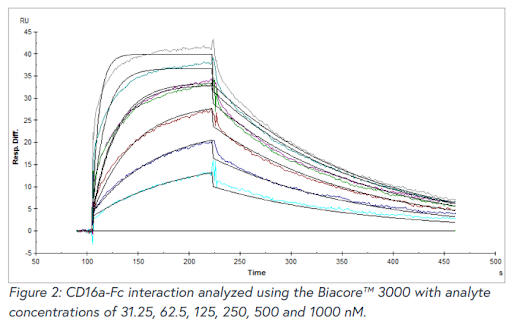 Results from the Fc-FcR interaction measured on the OpenSPR™, Biacore™ and Octet™ instrument can be found in Figure 1, Figure 2, Figure 3 and Table 1, respectively. Data was fit in each experiment with a 1:1 binding model. OpenSPR™, Biacore™ and Octet™ determined KD values of 74.7 nM, 48.7 nM and 226 nM, respectively. The calculated KD values between the OpenSPR and Biacore™ 3000 are very close, while the value reported by the Octet™ differs by ~5X. The kinetic constants determined from the fits are shown in Table 1. The off-rates are similar across all three instruments, however, the on-rates differ by over an order of magnitude for the Octet™. The quality of the fits is comparable for the OpenSPR™ and Biacore™, but there is more deviation from the model seen in the Octet™ data. It is common to see variations in measured affinity and kinetic values even when running assays on the same instrument. 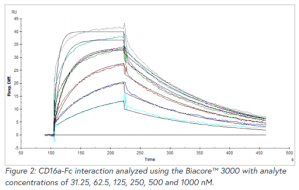 The closeness of the values between the Biacore™ and OpenSPR™ experiments demonstrate the comparability of these instruments for biomolecular interaction analysis. The slight differences seen can be due to minor differences in exact experimental conditions and materials used. The larger differences seen in the Octet data could be due to the higher immobilization level used, fitting differences, or fundamental differences in the dip and read technique used with BLI. 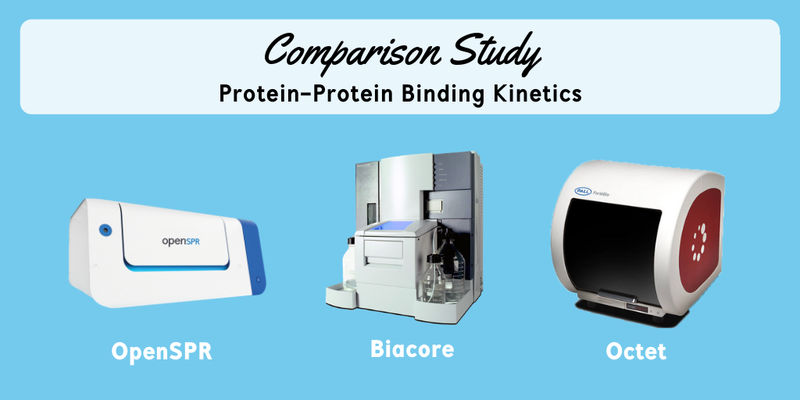 In summary, the OpenSPR™ and Biacore™ instruments reported similar kinetics and affinity values for the interaction studied. This supports the use of OpenSPR™ for accurate and affordable characterization of binding interactions. For a full list of publications using OpenSPR binding kinetics and affinity data, click here.